The HNH nuclease domain of Cas9 cleaves the DNA strand complementary to the RNA guide. 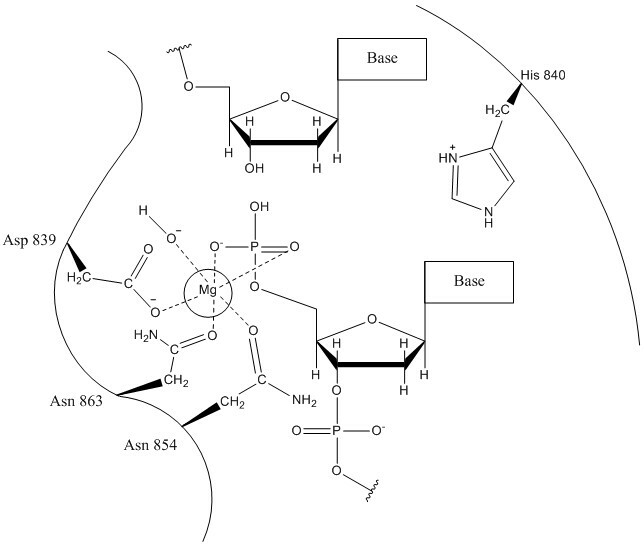 The HNH nuclease has a ββα-metal fold that comprises the active site shown to the right (Nishimasu et al. 2014). There are many structural similarities between this nuclease and others that contain the ββα-metal fold, such as phage T4 endonuclease IIV and the Vibrio vulnificus nuclease, both of which have very similar mechanisms to the putative mechanism shown below (Biertumpfel et al. 2007; Li et al. 2003). 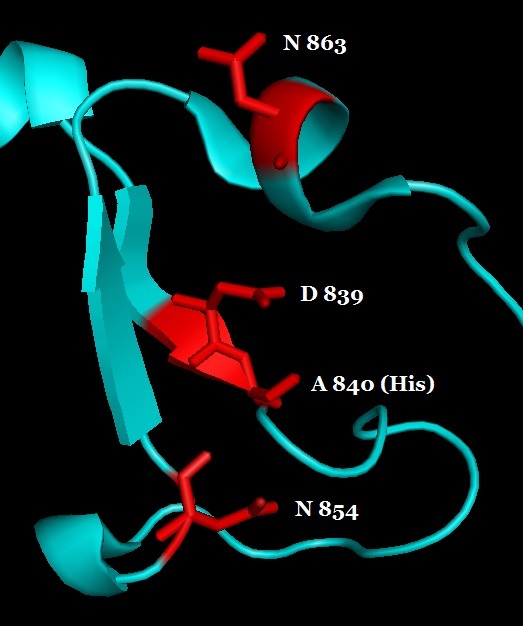 In order to produce this crystal structure, histidine 840 was mutated to an alanine, thus inactivating the nuclease so the DNA would remain bound without cleavage. The nuclease is conformationally compromised for this reason, and because magnesium ions were not crystallized with the structure. 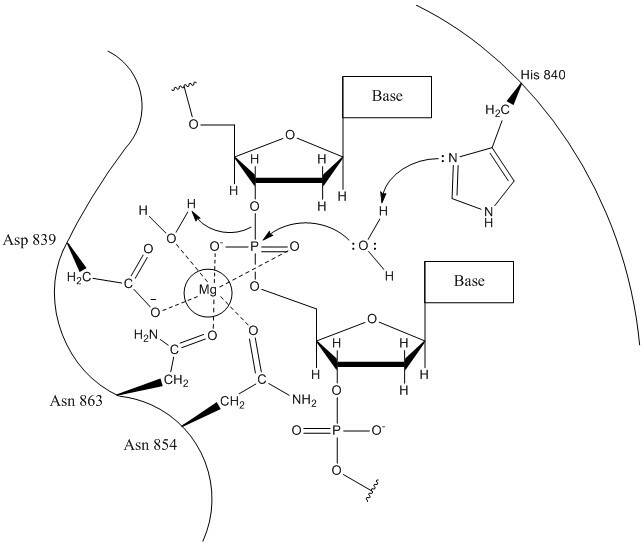 Mutation of histidine 840 to alanine, or asparagine 863 to alanine, results in an inactive HNH nuclease domain, and therefore produce Cas9 enzymes that can be used as a nickase (Nishimasu et al. 2014). Below is a putative mechanism for the nuclease activity of the HNH doamin of Cas9. The mechanism is based on mechanisms put forth for the Vibrio vulnificus nuclease and the Cas9 HNH nuclease (Li et al. 2003; Nishimasu et al. 2014). Histidine 840 activates a water molecule for attack of the scissile phosphate, which is made more electrophilic by coordination by a magnesium ion. Cleavage of the 3′ – 5′ phosphate bond completes the HNH nuclease mechanism. after launching it extensively from the Usa and You.K. before this calendar month. Skype for Website also now supports Chromebook and Linux for instant online messaging communication (no voice and video nevertheless, those require a connect-in installation). What does Ruv and HNH stand for?